There are only a few pictures in this post. Go here if you want to see all of the pictures for Greece summer 2015. At last we were in Greece. The hotel in Igoumenitsa (one of only a very few) turned out to be much better than the booking.com reviewers described. We had a good breakfast and there was even a lift. Then we set off across northern Greece. They have finally finished the Egnatia Odos, a new road through the mountains which was under construction for years. Driving on a dual carriageway was very fast compared with struggling up a twisty mountain road behind trucks and other slow moving vehicles. And it wasn’t raining either, unlike our previous times on this road. We soon got to the turnoff for Metsovo a town of Vlachs (originally nomadic shepherds who have their own language) high up in the mountains and took advantage of the sunshine to walk round, for once not getting wet in rain there. We then decided to carry on using the old road which was fine in spite of guidebook warnings about it not being maintained any more. It was lunch time and the map showed a lake a few kms just off to the left. It turned out to be a lovely area. 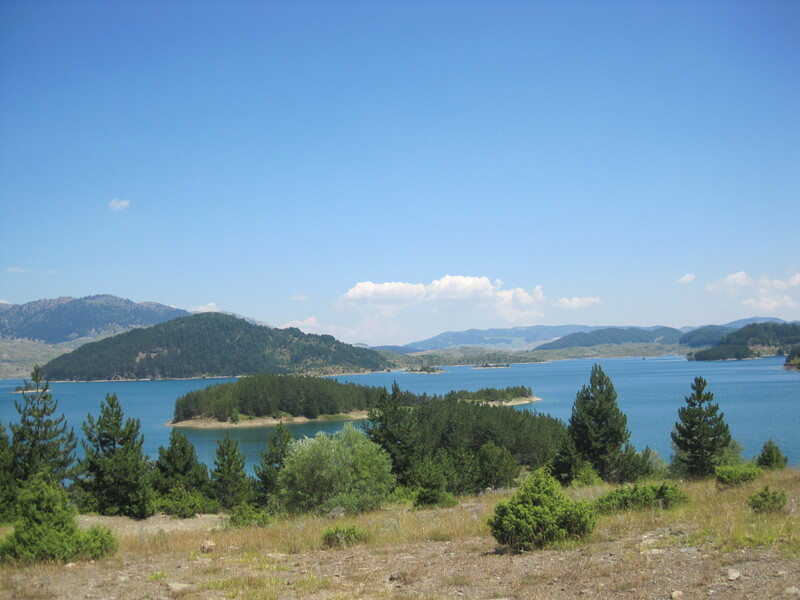 We drove along by the side of the lake passing a few remote farms, then found a picnic place on a spur by the lake. This was the first of several picnic stops we found in Greece where there was a hexagonal wooden structure with benches around the inside and, more importantly, a roof for sunshade. It was very peaceful and we stayed there for a while. We were amused at the pile of logs nearby where somebody had painted faces on the ends. The it was down and down to the plain in northern Greece and on to Kalambaka where the room in the B&B we had booked turned out to be large with a sitting area and a small kitchen. It was up a steep hill from the main road and the view, once we had found it, was excellent. We drove down into Kalambaka and had our first Greek dinner in a small plateia. The Greeks love to eat outside and I we hardly had a single meal indoors all the time we were there. 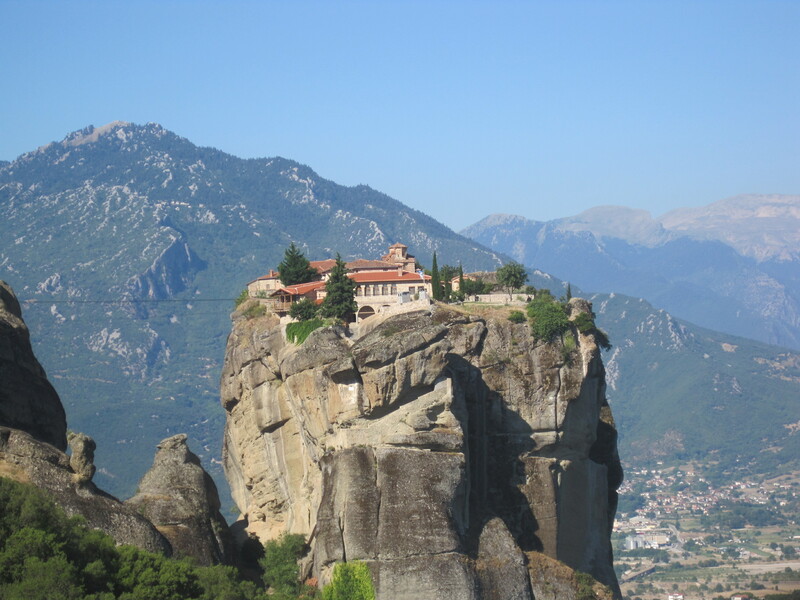 Our real reason for staying in Kalambaka was to see the monasteries at Meteora. We were last there in 1973, but not too much has changed except the number of visitors. They are all built on top of tall rocks and the monks used to be hauled up there in baskets. Now there’s a road and you can climb up steps to them. We went first to Agios Stephanos where you can even park outside on the road. This one is now a convent with nuns. The church was very ornate and covered with paintings and gold decor. Like the other monasteries there was a small museum and a shop. I think it was here where I bought a hand-painted fridge magnet which the nun personalized with my name on the back. We decided not to go to the two big monasteries, Grand Meteora and Varlaam which we had seen before and so went next to the Holy Trinity Monastery. To get to it you have to walk down a long way then up steps and through a tunnel. I just waited in the car while Martin visited it. I did do the walk up to Roussanou where you go up a lot of wide steps, then across a little bridge and up a some more steps. 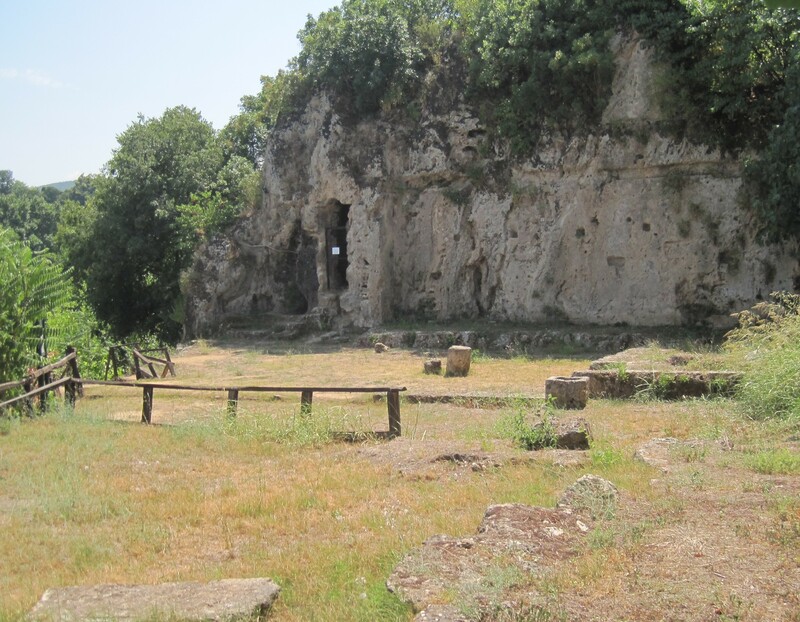 Roussanou is on a rock which is very small in area and is very compact on three floors. Pelion is another of our favourite areas in Greece. It’s a peninsular about halfway down the east coast of the mainland. Mount Pelion in the northern part is a high wooded area with plenty of walking trails. We drove down the Athens – Thessaloniki “motorway” which thankfully now has been converted into a dual carriageway, then through Volos (interesting navigation) and up a twisty road on to the mountain to the village of Kissos which has a lot of traditional houses and a typical plateia with a plane tree. The village car park was about 100 yards away. We found a place to stay in one of the old houses and had dinner nearby where I ate a tasty goat stew. The following day (Wednesday 29 July) we did a circular tour round the northern part of Pelion on twisty roads all day. We went first down to the coast at Agios Ioannis which was quite crowded, but with a long beach. We picked up a tiripites for lunch and ate it on the tiny beach at Damachouri which was a lovely spot, but without much parking space. We stopped at one or two other villages, but it wasn’t a long day and we stayed another night in Kissos. Pelion is great for walking, mostly on the old paths called kalderimi which tend to go straight up and down. We got up at 6.30 the next morning and had just a small bite to eat before setting off on foot at 7.15 down to the village of Mouresi, mostly on kalderimi. We got there about 10.15 and had a coffee in a cafe where the owner called a taxi to take us back to Kissos in time for breakfast in the B&B – it finished at 11. The owner clearly thought we had been mad to walk, but we were mostly in forest and it wasn’t too hot. We then set off southwards on Pelion. We stopped again at Tsangaradha, which is a very straggly village, and finally found the huge plane tree which the guide book had mentioned. Further south in Pelion the scenery began to look more like typical Greece with fewer trees and stony hillsides. We found a half-board room in a hotel at Horta. This hotel was the only one we stayed in in Greece which was really intended for package tours. It was very good value, but the food was fairly mediocre. 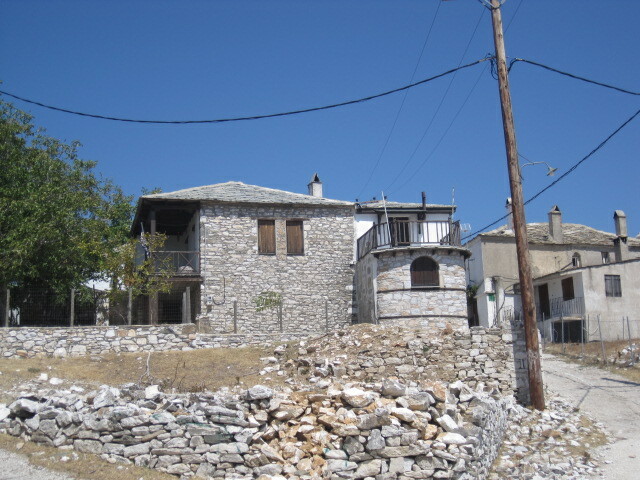 Trikeri is the largest place in the very south of Pelion. It’s on the top of a hill. We went past some nice (and nearly empty!) beaches and drove up OK. We then tried to drive through the town, but got stuck with some narrow streets and bends. We had to turn the car round in a small space with a 3ft drop (no fence) at one side. Some of the villagers came out to look (and give directions). It seemed that we were not the first people to be stuck here. We did finally find the proper village car park and a lovely Greek church with whitewashed walls and blue painted doors. Agia Kyriaki was the southernmost point of our trip. It’s a fishing village and we ate our very favourite meal, a fish in a taverna by the sea. We had more problems driving through this village as there was a very tight right hand turn then more narrow streets, but we did finally make it. We had booked a room in another traditional Greek house (Katerina) in Vyzitsa back in the north of Pelion. This was beautifully and tastefully furnished and the owners were very kind. Vyzitsa is all on a steep hillside. There was a track to drive up to the house, but we could walk down some steps and to the village to eat. It was very quiet (hardly anybody eating there) in spite of it being one of the main tourist sightseeing villages in Pelion. Business seemed very slack. We decided to stay another night and to do a walk down to Kala Nera on the sea. The owners seemed to think we were slightly mad and kept saying that it was 10km. We set off later this time, but it wasn’t too hot in the forest. It was almost all downhill. The kalderimi were a bit overgrown and we did the last bit on a rough road which was further but easier to walk. Kala Nera was as crowded as all the other beach places we saw. We had some lunch in a taverna on the beach then walked back to the main road to find that the little office by the bus stop was closed (for a long lunch). No buses came, but there was a taxi number on the window. We phoned it and soon got back to Vyzitsa. We finally left Pelion on Sunday 2 August and stopped first in the big town Volos to get some more money and food. Sunday was a good time to park in a big town. We had coffee in a cafe by the water then set off northeast over more small roads towards the coast. To begin with it was fairly flat. 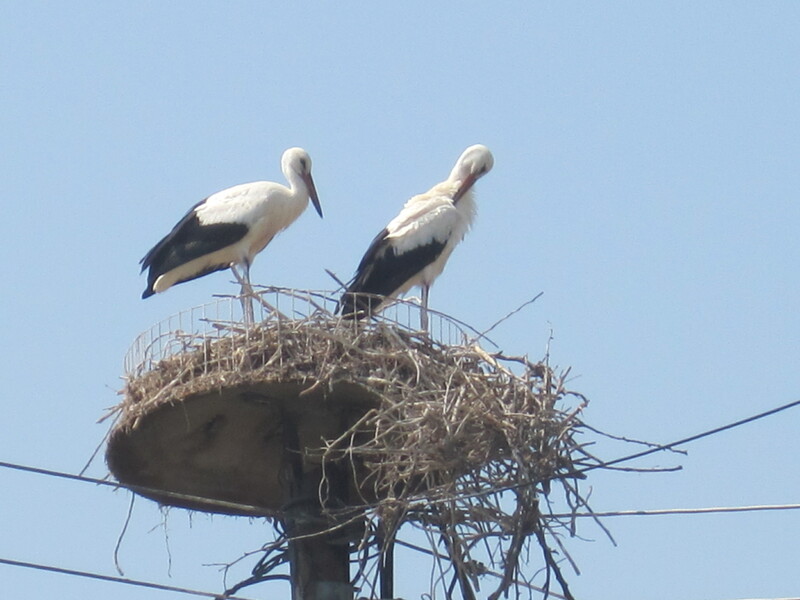 We drove past a lake and then a village where there were storks in a nest on a lamp post. We expected to see more storks but these were the only ones we saw on the whole trip. Storks somewhere north of Volos – the only ones we saw. We then went over the mountains and down to the coast, meeting a large herd of goats in one place, then finding another picnic shelter with a spectacular view. The coast north of Pelion is not well known in Greece, but we found a huge sandy beach which was almost empty. However the town of Ayiokampos was not empty – there were plenty of day trippers from Thessaloniki as it was a Sunday. We didn’t fancy staying in any of the many beach room places there and drove back a bit to a place called Pension Paradies which was run by a German. It was very Greek and we had another nice meal. The beaches were emptier the next day, but we carried on north by the coast and then inland to the village of Vergina where there are a number of Macedonian tombs including that of Philip, the father of Alexander the Great. The tombs had all been turned into a museum with a dome-like grass-covered building over them and it took a while to work out exactly what this building was. There were replicas of the tombs but you couldn’t go into the actual tombs, only as far as the entrance doors. The museum had a good display of artefacts found in the tombs, a lot of which were gold. We stayed in a B&B next to the ancient theatre where Philip was murdered. We were the only people there again. There was more sightseeing the next day when it was again very hot. We could see why they built the old towns on the tops of the few hills. We looked round the old town of Vergina and saw the shrine at a place where St Paul is supposed to have preached, also plenty of old houses and some churches. Then we went to the remains of Aristotle’s school where he tutored Alexander the Great. This was a lovely place by a river and I could just imagine them walking up and down philosophising. There was a new visitor centre where one of the researchers insisted on giving us a lecture about the site. Our last site that day was Pella, the capital of Ancient Macedonia. This is a huge area (with a modern town in the middle). We saw some of it, including three 4thC BC mosaics which are still in situ and protected by shelters, but I found it too hot (37C+) for the rest of it. The museum in the north of the town, however, was excellent. It contained more mosaics which had been removed from the site, and plenty of other artefacts. The building itself was huge. There were a few other tourists in the museum, but none at all at the site. We didn’t make a good choice of place to stay that night. 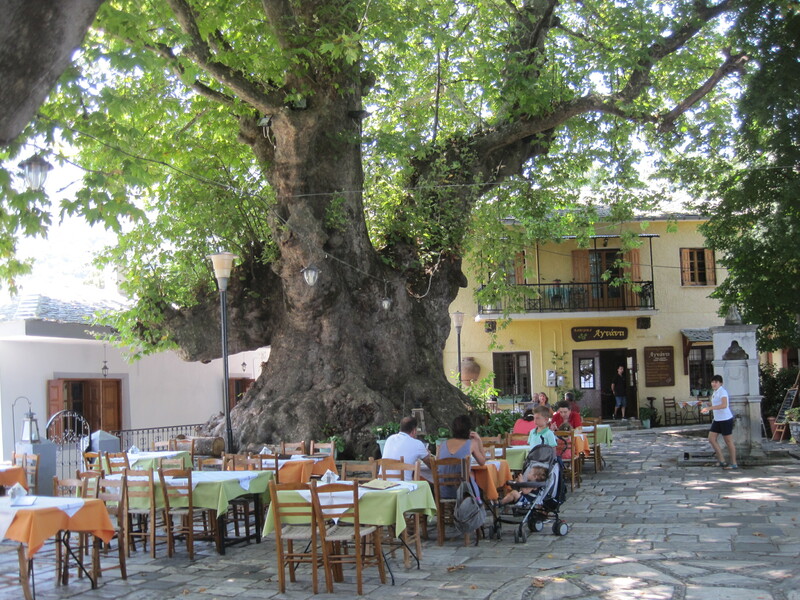 The guidebook and booking.com showed plenty of places at Stavros on the east coast of the northern part of Halkidiki. We had booked what appeared to be, and probably was, the nicest hotel, but the whole town was rather grotty and very busy. We walked about 1km to get some dinner and ate a rather poor meal by the beach. Stagira, the birthplace of Aristotle is a bit further down the coast. It was a pleasant but fairly small site. There’s a longer walk round. Martin did a bit of the walk but it was again very hot. We went on the motorway to Kavala where we finally found a Greek cake shop. Somehow they didn’t seem to exist at the right time of day anywhere else where we had been. Then it was a short drive to the village of Toxetes where we had booked a B&B which turned out to be almost a whole house. The owner Eleni (and her 4 dogs) lived next door. There were 4 bedrooms and a large sitting area upstairs and a kitchen, dining and sitting area downstairs. We hardly saw the other people staying there, a family in another room downstairs. Toxetes is a small village but we had a wonderful meal in a restaurant in the centre. There was also a mosque, the first of several we were to see in this part of Greece. 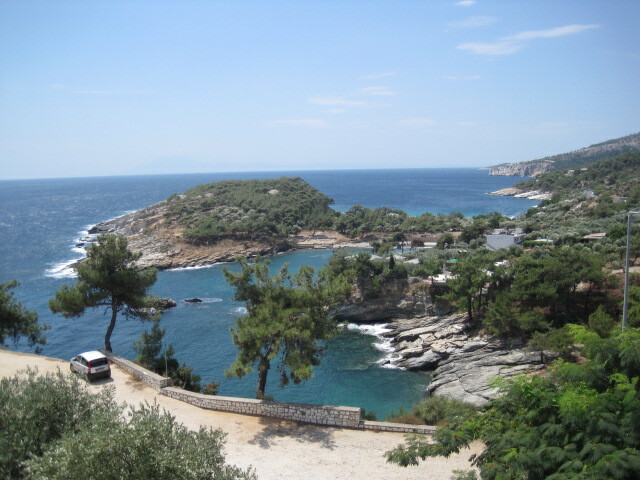 We had been thinking about going to the island of Thassos, but were a bit worried about long waits for the ferry etc. Eleni told us that there would not be a problem and so we booked a room on the northwest of the island and took the ferry from Keramoti the next day. It’s a flat bottomed boat and you just turn up. 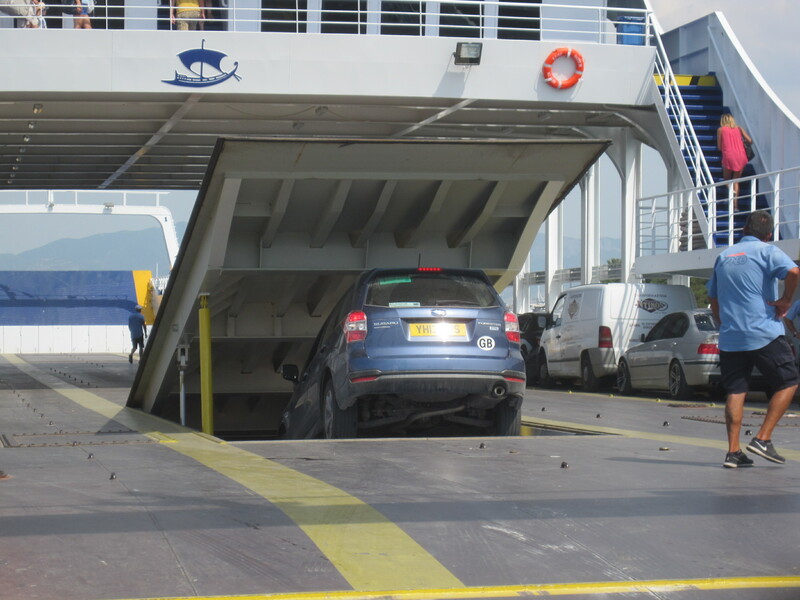 A ferry was loading when we got there and so I rushed to the ticket office where the Subaru was deemed to be a large car. As we were driving on we were told “lady out, driver only” and so Martin drove the car down another ramp to the lower deck, forwards this time. The trip took only about 45 minutes and we drove off in Thassos town. It was still only late morning and so we looked round there for a bit. It’s a pleasant place with plenty of tourist shops selling the usual things of honey, oil and herbs as well as ornaments and bags and plenty of restaurants across from the water. We saw a good few Brits wandering round. Our first two nights in Thassos were at a small hotel called Louloudis Fresh. It was modern and we had a nice room facing the sea. We needed to drive to the nearest restaurants, two together on the beach. We ate in each of them. The food was fine, but the tables were very close together. Thassos is almost circular and we spent our first full day driving round the island. It’s only about 60 miles round, but we took two detours up into the mountains to the villages of Megalo and Mikro Prino which had a lot of traditional houses, then also to Theologos, another mountain village quite high up. We had trouble in another narrow street in Skala Marion in the south west, but finally extricated the car and ate our lunch on yet another crowded beach. We stopped at the Archangelou Monastery which is in a spectacular position by the sea. Photos aren’t allowed inside, and we had to use a big zoom from some way off to get a good view from the outside. One of our aims in going round the entire island was to find somewhere to stay for another two nights. We had read that Aliki in the southeast was the nicest place. None of the places there had online booking, but we stopped at the Hotel Archontissa perched on a hill overlooking the promontory at Aliki. This was a traditional Greek hotel and we decided to stay for the following two nights. We got to the Archontissa quite early the next day and walked down to the tiny beach below it, then back up to the road and to Aliki village where we had lunch, avoiding the octopus hanging up, in a restaurant overlooking a beach that was so crowded that you couldn’t walk on it. There’s a nice one hour walk round the promontory where there are some ancient marble quarries. We completed the walk but it was very hot again and we had walked a long way by the time we got back to the hotel and were dehydrated. A large party (20+ people) from Istanbul arrived for dinner just as we were eating. They all spoke excellent English and one of them told us that they were going to make some noise and hoped we wouldn’t mind. It turned out that he was a musician and his repertoire was quite varied. For the benefit of everyone else eating there, he introduced every song in near perfect English. The dancing started later on and some of the Greeks at the restaurant joined in. Some of the younger people in the group started talking to us in excellent English – they had heard Martin say to me that they were speaking Turkish. They told us that their parents had met at a business school in Istanbul and remained friends ever since. The party was winding down a bit when we went to bed at 1am. The next day (Sunday 9 August) was very quiet. We stayed in the hotel where there was a lovely view from the balcony and read up about Bulgaria. We also e-mailed Eleni for another night in Toxotes. We aimed to take the ferry back to the mainland in the late afternoon of 10 August. In the morning we drove up a gravel road (with a steep unfenced drop on one side) to Kastro which was once an important town in Thassos. It’s about 450m up on the top of the hill. Now almost all the village is deserted. We found just one building occupied which was a cafe where we had lovely yoghurt, honey and nuts. The owner took us into the small church next door. There were several other tourists there and we chatted to them a bit. Most had come in hired jeeps although it was just possible to get there in an ordinary car. 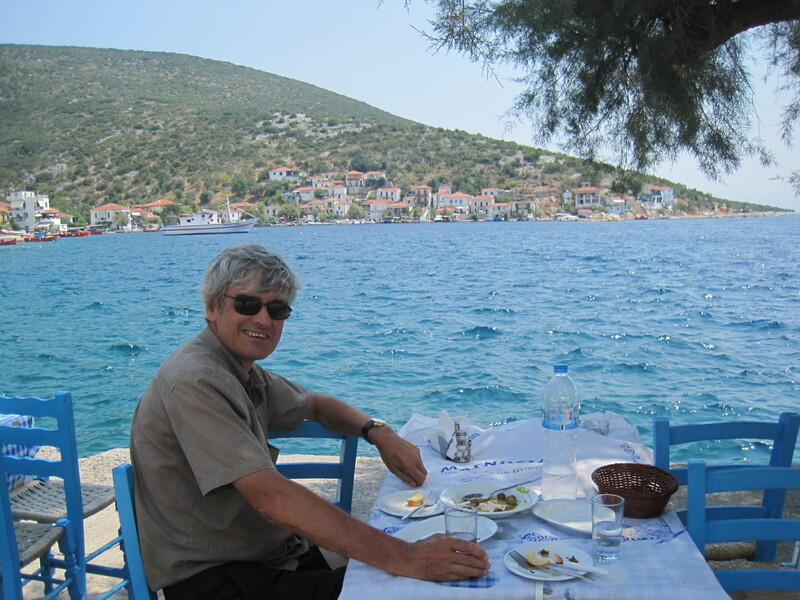 Our last meal in Thassos was lunch at Skala Sotiras on a beach which wasn’t quite as crowded. The late afternoon ferry was a smaller boat and much less busy. We were soon back at Toxetes and ate in the same restaurant there, this time in the plateia. We have been to a lot of Greek islands and Thassos ranks quite high up. The scenery was very nice, quite varied and there’s plenty to see, and plenty of sandy beaches and good food as well. However I would not go there again in the height of summer as anywhere near or on a beach was very crowded indeed. Most beach restaurants were jam packed (with a lot of heavy smokers). Most of the people had driven there from Bulgaria and Romania just for the beach. After all it’s only a day’s drive from Sofia or Bucharest. We saw quite a few cars from Istanbul as well. I would definitely go again in May or September. We found some lovely walks but it was too hot to walk in the full sun. We visited one more place in Greece, the town of Xanthi where there is some interesting architecture in the old town on a hillside. We saw Turkish people who live in Xanthi and we found a mosque with a burial ground outside it. When we left Toxetes for the second time on 11 August, we had done 3578 miles from leaving home. All in all it was great to go to Greece again. Outside the beach areas it was very quiet. It seemed that tourism was down a lot – presumably because of the news about their economic situation. We had no problems at all getting cash or in using credit cards where they were accepted. Everywhere looked just as normal, although we heard from Eleni, who was a civil engineer, and others that business was very slack. However, the Greeks are optimists and very outgoing and we enjoyed meeting a lot of them. We didn’t see a single migrant or refugee. You find all the pictures for Greece here.